NINE at Berowra Waters is a waterfront property surrounded by eucalyptus bush, ancient sandstone cliffs with aboriginal rock carvings amongst the local fauna and flora. A peaceful natural paradise only 50 minutes from Sydney CBD. A perfect house for short stays with families or groups of friends to relax, fish, hike, swim, kayak and connect with the natural environment around you. Your stay at NINE, Berowra Waters will be one to remember! The property has four queen sized beds, two with en suite, two with water views. All beds come with high quality Egyptian cotton bedding and feather mattress toppers to ensure a restful nights sleep. A very well equipped kitchen makes a self catering holiday easy and you can just sit back and relax on the deck while the food sizzles on the BBQ. An outdoor hot tub / spa and entertaining space puts the finishing touch onto your stay at NINE. In the evening, look up at the immense sky and see the milky way whilst relaxing in the hot tub, a perfect way to end the evening. If you prefer to stay indoors, there are 2 flatscreen TVs, both with Netflix and Foxtel so you can enjoy an evening of entertainment or sport whist relaxing on the couch. The house has so many features that's impossible to show you in pictures and words, you really have to see for your self! Berowra Waters has top notch award winning restaurants on the doorstep! Try the degustation at Berowra Waters Inn or a seafood smorgasborg at the Waterview Restaurant. Alternatively, for lunch head to the lovely Italian influenced 'Chef's Secrets' or for a more casual dining experience, the Fish and Chip Cafe is open from Wednesday to Sunday. The wonderful Peats Bite restaurant is about 20 minutes down river and can be accessed via the water taxi to and from the restaurant door to door. A Chefs Secret - Italian style café located on the eastern side of the river. Berowra Waters, your ideal NSW holiday destination offers excellent bushwalking, fantastic Hawkesbury River fishing, absolute waterfront dining, a range of attractions, water sports and things to do. The best value Berowra Waters accommodation with the best accommodation deals & packages. The Great North Walk runs through Berowra Waters for those who wish to take a stroll and seek out the native Waratah's, Boronia and Flannel flowers and local fauna. 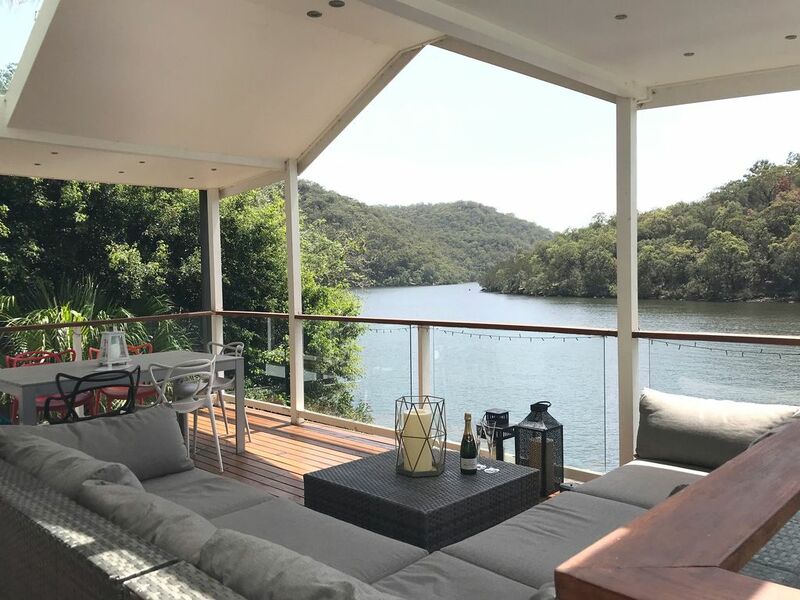 We fell in love with Berowra Waters after visiting with friends several times and were so excited to find the perfect property in the heart of the area. We're both creative people so we couldn't wait to bring the house to life. The garden's, entertaining decks, water views, the incredible Berowra Waters Inn a stones throw away and our beautiful neighbours make this property the perfect location on the river. Everything about this property is incredibly special. It feels a million miles away from Sydney city but is only 1 hour's drive. A house with your own pontoon and runaround boat is pretty special. An area to be discovered or just a place to relax in the lower garden, with a glass of bubbles and watch the boats, sea planes and wildlife go by... In the evening, enjoy the moon reflecting on the water or sitting in the spa in the evening and wonder at the starry night sky. This house is unforgettable. 2 large entertainment decks with BBQs over looking the water, water views from bedrooms, kitchen and living areas. Absolute waterfront property with own pontoon and use of run around boat. Facilities include kayaks, fishing rods and sun loungers. Salt, pepper, condiments, some herbs and spices. We supply tea, coffee (pods for machine), jams, bread, milk and butter. Plenty of everything you'll need! Very large kitchen. All amenities, guests describe kitchen as 'best stocked rental kitchen ever!' Oven, gas cooktop, dish washer, large pantry, separate fridge and freezer, beer fridge, water views. 2 single and 1 double (with room for small child). Life jackets and oars supplied. Outdoor tub with entertaining deck, private and wonderfully relaxing. We enjoyed out time at NINE immensely. It was wonderfully appointed and incredibly relaxing. The boat transfer was easy and the tinny was so much fun! The complete package. Very hard to beat. We will be back! Thank you for your lovely review Tim, really happy you and your family had such a good time at NINE. We'd love to welcome you guys back. Thank you very much Daniel for your lovely review, happy to see you and your family had a wonderful Christmas at NINE! We had a wonderful time last weekend...the house is perfect for a weekend escape; well equipped kitchen and fantastic spa! The house was clean and welcoming and the beds very comfortable. Thank you for your lovely feedback, happy to hear you girls really enjoyed yourselves. We are thrilled you had such a good time at NINE, Berowra Waters. I know you were hoping for a relaxing weekend away, and I hope you got what you wanted. We would happily welcome you back. Walking, swimming, kayaking, paddle boarding, fishing and boating... or just relaxing and enjoying the natural environment around.